Buy Online Now! Classic Bad Manners Concert Posters and Memorabilia. Back in 1976 some London based school chums formed a band. In the beginning there was not even a name and the first gigs took place in the school canteen. Sounds pretty familiar, innit? In 1979 and after some changes in the line-up – some of the guys changed their names, others quit – they started their way to the top. In the following 4 years 15 of their songs entered the british charts, including Lip Up Fatty, Special Brew and Lorraine, to name just a few. They performed at “Top of the Pops” and other TV-Shows, were banned from italian TV and had shows with bands like Iron Maiden. The undisputed face of the Bad Manners was former Douglas Trendle, now called Buster Bloodvessel after a grim-looking passenger in the Beatles “Magical Mystery Tour”-movie. Ever since the Bad Manners toured the world, entertained their audiences to the max and published one fantasic record after the other. And Buster Bloodvessel gained weight. And even more weight. His body swoll to enormous size and he was called “Lord of the Onion Rings”, Fatty and other names like that. 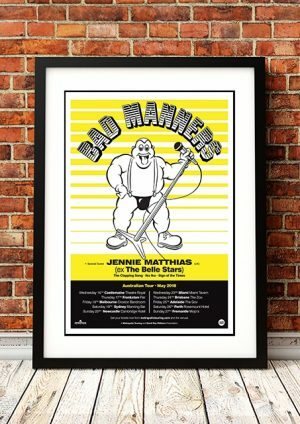 We stock an awesome Bad Manners Print.